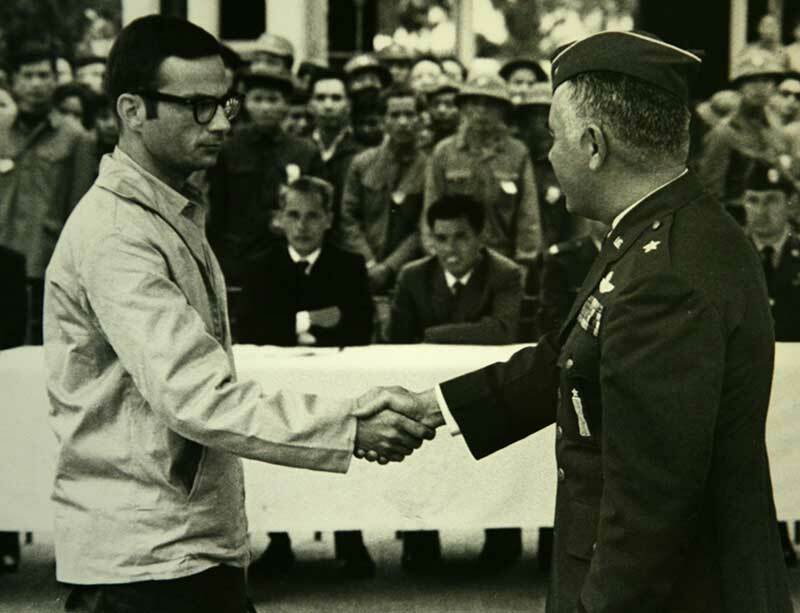 Former Vietnam POW Dr. Hal Kushner – For Love of Country and the 1-9th! Looks are deceiving! 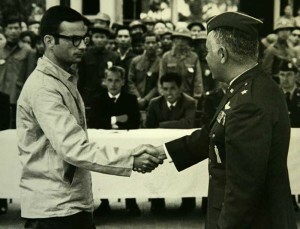 This historical photo shows Dr. Hal Kushner being released from a North Vietnamese prison in 1973, after 5 1/2 years. By coincidence, Dr. Hal Kushner, a former Vietnam POW, is a friend of Dr. Woody Hunt, the 2011 Commodore of San Diego Yacht Club. I’ve always felt a special kinship with Woody, knowing that his pre-ophthalmologist days in San Diego were in the Navy during the Vietnam War as a flight surgeon–sometimes flying backseat in F4s–the aircraft that my first husband, Capt Jerry Zimmer, USMC, flew in Vietnam before he was shot down and declared MIA. Nothing has been edited in Dr. Kushner’s speech, nor have I split up the copy with teaser excerpts. Once you start reading his remarks, I know you’ll be riveted. The Words of Dr Hal Kushner…. “I want you to know that I don’t do this often. I was captured 2 Dec.1967, and returned to American control on 16 Mar.1973. For those of you good at arithmetic 1931 days. Thus it has been 32 years since capture and 26 years since my return. I have given a lot of talks, about medicine, about ophthalmology, even about the D Day Invasion as I was privileged to go to Normandy and witness the 50th anniversary of the invasion in Jun.1944. But not about my captivity. I don’t ride in parades; I don’t open shopping centers; I don’t give interviews and talks about it. I have tried very hard NOT to be a professional POW. My philosophy has always been to look forward, not backward, to consider the future rather than the past. That’s a helluva thing to say at a reunion, I guess. In 26 years, I’ve given only two interviews and two talks. One to my hometown newspaper, one to the Washington Post in 1973, and a talk at Ft. Benning in 1991 and to the Military Flight Surgeons in 1993. I’ve refused 1,000 invitations to speak about my experiences. But you don’t say no to the 1-9th, and you don’t say no to your commander. COL Bob Nevins and COL Pete Booth asked me to do this and so I said yes sir and prepared the talk. It will probably be my last one. I was a 26-year-old young doctor, just finished 9 years of education, college at the University of North Carolina, med school at Medical College of VA, a young wife and 3 year old daughter. I interned at the hospital in which I was born, Tripler Army Med Center in Honolulu, HI. While there, I was removed from my internship and spent most of my time doing orthopedic operations on wounded soldiers and Marines. We were getting hundreds of wounded GIs there, and filled the hospital. After the hospital was filled, we created tents on the grounds and continued receiving air evacuation patients. So I knew what was happening in Vietnam. I decided that I wanted to be a flight surgeon. I had a private pilot’s license and was interested in aviation. So after my internship at Tripler, I went to Ft. Rucker and to Pensacola and through the Army and Navy’s aviation medicine program and then deployed to Vietnam. While in basic training and my Escape & Evasion course, they told us that as Doctors, we didn’t have to worry about being captured. Doctors and nurses they said were not POWs, they were detained under the Geneva Convention. If they treated us as POWs, we should show our Geneva Convention cards and leave. It was supposed to be a joke and it was pretty funny at the time. I was captured on 2 Dec., 1967 and held for five and a half years until 16 Mar, 1973. I have never regretted the decision that I made that Aug. to be the 1-9th flight surgeon. Such is the honor and esteem that I hold the squadron. I am proud of the time I was the squadron’s flight surgeon. Click here for continuation of the speech. This entry was posted on Saturday, February 26th, 2011 at 3:37 pm	and is filed under Honoring Our Military, Vietnam Heroes, Vietnam Heroic Efforts. You can follow any responses to this entry through the RSS 2.0 feed. You can leave a response, or trackback from your own site.